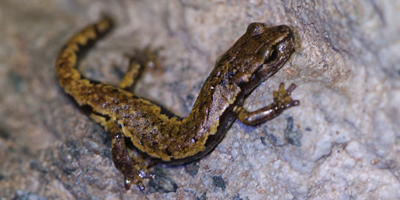 The Italian cave salamander is a species of salamander in the family Plethodontidae (salamanders without lungs, breathing through moist skin), about 12 cm. long, with a broad head with prominent eyes. It is dark brown-reddish color. Endemic to northern Italy, its habitats are temperate forests, humid rocky areas, caves. The female lays a small clutch of eggs in a crevice and these hatch by direct development into miniature salamanders. It is a near threatened species (IUCN, 2009). The major threat are the loss of habitat and the collection of specimens. The climate change can threaten the species, because of the longer and dryer summers. composition, creating laying dead wood: obtaining, as a result, more litter and a more humid forest soil, rich in shelters for the salamanders. IUCN (2009) Franco Andreone, Paul Edgar, Claudia Corti, Roberto Sindaco, Antonio Romano. 2009. Speleomantes italicus. The IUCN Red List of Threatened Species 2009: e.T20458A9201759.